$2,600.00 Order of the Red Star, Type 3 Var. 2 "Large Mondvor" version, #7671, circa early 1940. This is almost for sure an award for the "Winter War" against Finland. An outstanding, excellent example - extremely uncommon among the Soviet military decorations of pre-Patriotic War vintage. $1,200.00 Order of the Red Star, Type 4, Var. 1, Sub-var. 1, #11664, awarded in April 1940 to an artillery NCO for the "Winter War" against Finland. An extremely interesting early piece with the serial number below the standard range for the Type 4 "Monetnyi Dvor". 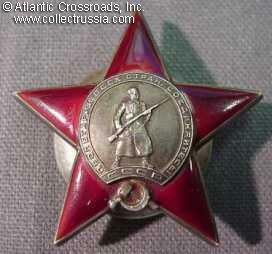 In excellent condition, superb for any Red Star of pre-Patriotic War period, and includes original silver screw plate. Comes with basic archival research. $140.00 Order of the Red Star, Type 6 Var. 1, #587063, circa mid-1944 issue.A relatively early piece with beautiful enamel and distinctive "chagrin" pattern on the reverse. In excellent condition and includes original silver screw plate. $150.00 Order of the Red Star, Type 6, Var. 3, Sub-var. 5, #2797001, circa 1947-48 issue. Scarce version with "Attached Bayonet". In excellent condition. $75.00 Order of the Red Star, Type 7, Var. 2, Sub-var. 2, #3253814, circa 1954 issue. In outstanding condition. $1,200.00 Order of the Red Star, Type 7, Var. 2, #3395921, with a document, issued for playing active role in crushing the Hungarian revolution in 1956. The award recipient, deputy commander of a mechanized regiment, led a successful armored attack on an airfield near Budapest as well as the capture of key installations in the town of Mosonmagyaróvár near Austrian border. This scarce award is a vivid reminder of one of the pivotal events of the Cold War. Comes with archival research. Both the award and the document are in near mint condition. $195.00 Order of the Red Star, duplicate issue, #2562280. Featuring a serial number stamped in small font, this is a scarce official replacement award in exchange for a lost or severely damaged WW2 era original. In excellent condition. $6,500.00 Order of the Red Star, counterfeit manufactured in Germany, #505342, circa 1943. This professionally made copy of the Order of the Red Star was intended specifically for Nazi infiltrators masquerading as Red Army servicemen. A documentary proof of existence of such counterfeits - along with photos - was found in recently declassified NKVD archives. Extremely rare piece. $59.00 "The Order of the Red Star" Subtitled "The History of Institution of the Award and the Evolution of Its Badge". Durov, Strekalov, C. 2008, Moscow, Russian text, large format, 334 pp. Another landmark reference that is required reading for serious collectors!